It’s a night full of performances. The show kicked off with an opening performance from the X Factor Philippines host KC Concepcion. Next up were duet and group performances from the three grand finalists with Angeline Quinto, Jed Madela, and Jovit Baldovino. Comic antics from Manny Pakyaw with Kedebon and K Brosas with Osang (see the X Factor Philippines auditions) followed after. Yeng Constantino also sang along with Allen Jane Sta. Maria and Jeric Medina (both from the top 5) as well as Daddy’s Home. All top 12 finalists also performed as a group followed by solo numbers from the X Factor judges and a duet between the top three finalists and their respective mentors – Charice and KZ, Gary V. and Daddy’s Home, and Martin Nievera with Gabriel Maturan. After the performances, voting lines were closed and the winners were announced soon after. But before names were called, prizes were mentioned as listed below. Grand Winner – KZ Tandingan! 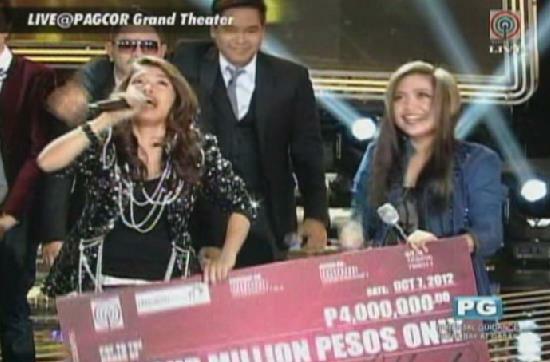 Congratulations KZ Tandingan of Digos City, Davao for being the first ever X Factor Philippines grand winner!